Warner Bros. Home Entertainment announced today that Batman v Superman: Dawn of Justice will make its digital debut on June 28th. The film sees Batman, Superman and Wonder Woman together in live action to face the threats of Lex Luthor and Doomsday while Batman and Superman confront their own inner demons and each other. The release comes with the Ultimate Edition R-rated cut, extending the film by a half-hour. It will be available on Amazon, CinemaNow, Flixster, iTunes, PlayStation, Vudu, Xbox and others platforms. 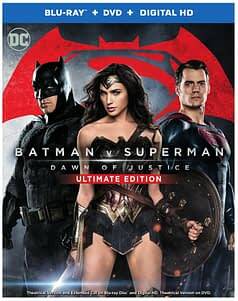 Following that, the Ultimate Edition will make its disc debut on July 19th, with both the theatrical and extended cuts of the film and a bevy of special features including a number of featurettes focusing on the trinity of heroes, bringing them together for the first time in a feature film and building the new Batmobile. The Ultimate Edition will be available in Ultra HD Blu-ray, 3D Blu-ray, and 2D Blu-ray Combo Pack editions and as a two-disc DVD. A new trailer has also been released featuring some of the new footage and a quick glimpse of actress Jenna Malone, whose scenes were cut from the theatrical release.